Don't worry Mom...it's really SAFE here, we promise! 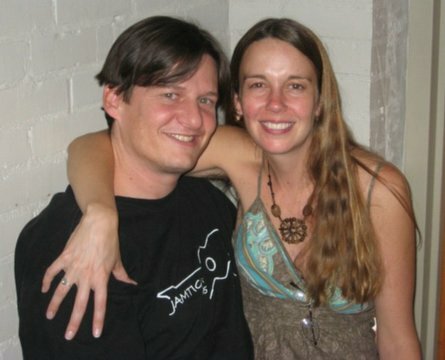 Love...Carley, Rob, Jennifer, Mark and Kina. 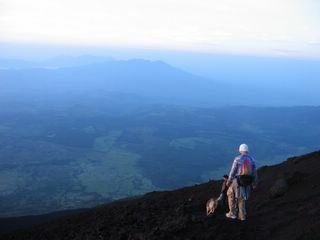 Early on the morning of July 6, we hiked almost all the way to the peak of Pacaya, one of Central America’s most active volcanoes! 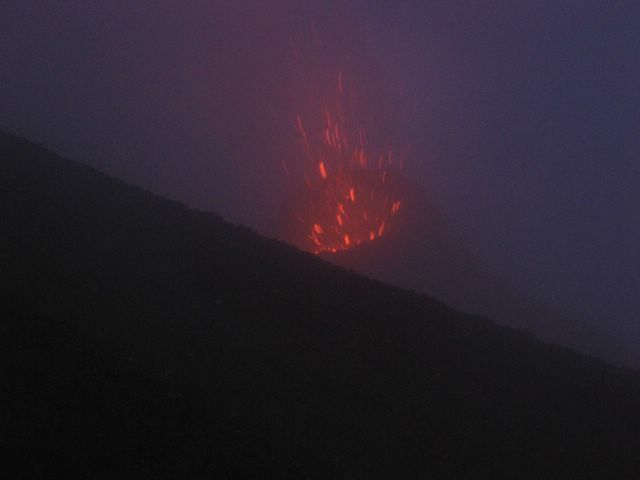 (click here for more info) This volcano has been erupting constantly since 1965, emitting a plume of ash and smoke, as well as intermittent fountains and occasional rivers of lava. It’s easily visible from the capital, Guatemala City, and from time to time, the eruptions become so severe that local communinities need to be evacuated. 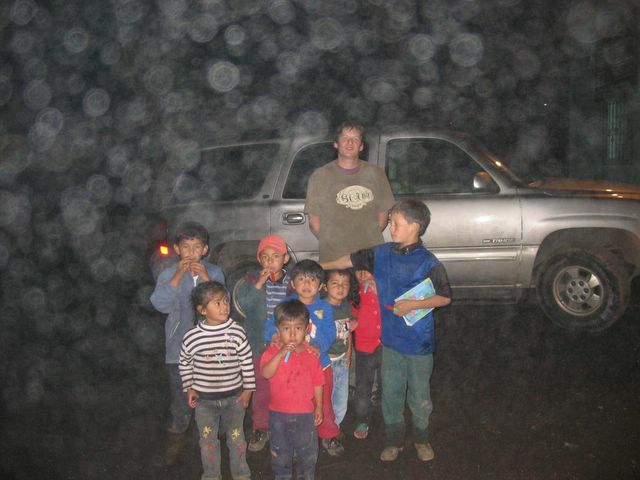 In 1998, the eruptions caused forest fires and airport closings as far away as Honduras. At the top of our climb, we stood no more than 30 meters from the cone, which was tossing lava into the air with a soft “whoomp” every 5 or 10 seconds. Needless to say, standing here was quite an exhilarating experience! Sunrise from above the clouds, standing near the erupting crater. Heading back down the volcano. 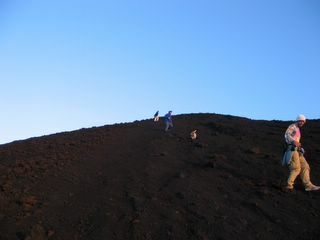 This part near the top of the cone was so steep, we had to practically "ski" down through the cinders in our shoes. Joining us on our hike were our friends Mark and Jennifer, who were visiting from the U.S. (Tucson, Arizona) to travel around Guatemala for a month. We suspect this will be one of their more memorable experiences here. 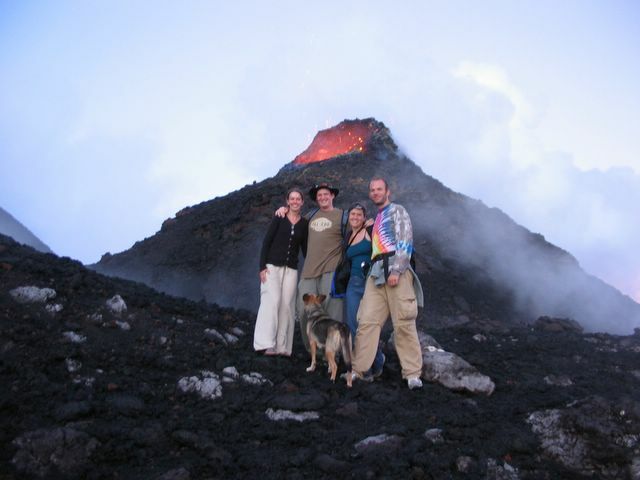 Most tourists who climb Pacaya arrive here on a tour bus from Guatemala City or nearby Antigua, where there are multiple tour companies offering package deals which include transportation and a guide. The tour groups make the climb in broad daylight, since the National Park doesn’t officially open until 7am. From what we’re told, the tour groups are not allowed to get closer than 100 meters from the cone. And what a deal we worked out! Not only did Ervin take us all the way to the top, far past where the large tour groups have to stop, but he also allowed us to set up our camp in the office of the Park Headquarters! (The nearest hotel was a 30-minute drive back down the dirt road, and it was notably over-priced.) In addition, he walked to the local liquor store with us the previous night and got us the “local” price for a bottle of rum, so we wouldn’t have to pay the “tourist” price. 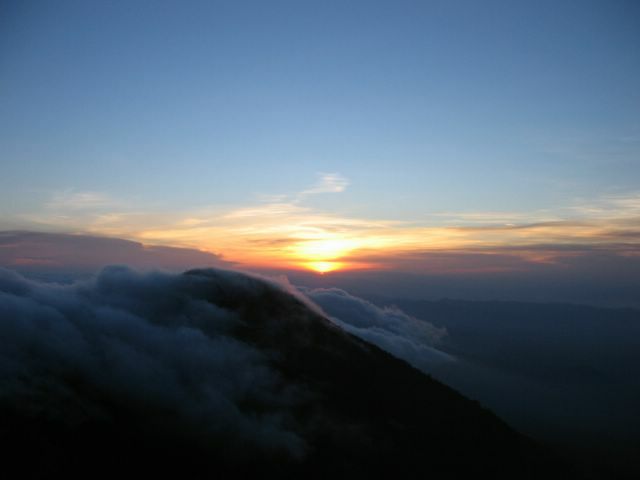 Finally, he showed up right on time at exactly 3am, as we’d requested, so we didn’t oversleep and miss the sunrise from the peak. 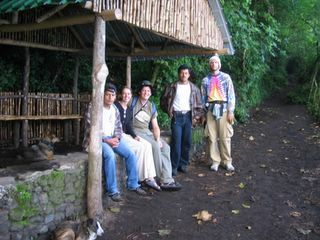 At the end of our hike, with our guide Ervin (left), our armed guard Benjamin (right) and Mark (far right). 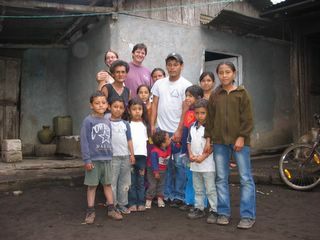 Our guide Ervin (center, with white t-shirt) and his extended family, at his house near the base of the volcano. 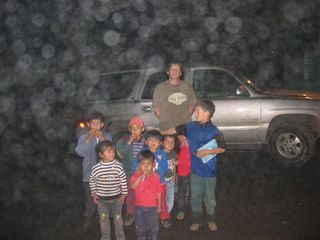 A bunch of local kids from the village of San Francisco visit us at our "camp" at the National Park office, all blowing loud whistles. They seem to like gringos here!